Content is great. As marketers, we make piles of the stuff. Blog posts, videos, infographics, images, ebooks, whitepapers, and more, all designed to drive people towards the same end-goal. For most marketers, the reason for the continued creation of content is simple. Because it leads potential and current customers through the funnel. 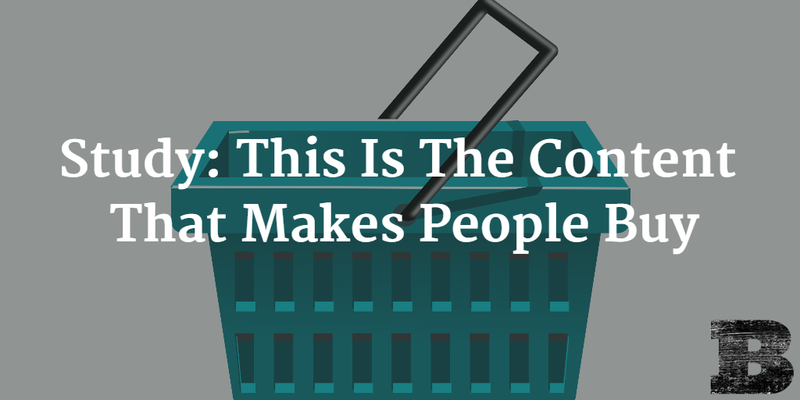 But have you stopped to figure out which types of content are actually making people buy? 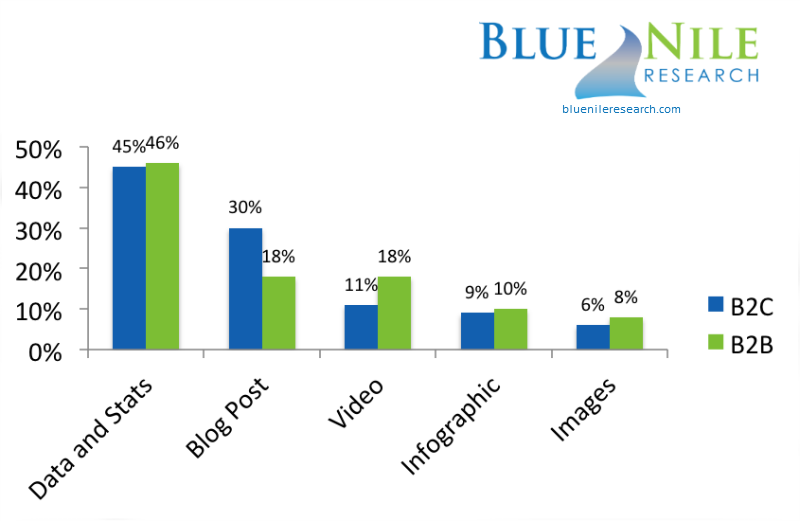 Blue Nile Research recently studied a group of B2B and B2C buyers to find out what type of content most compels them to buy. The insights they found are something all content marketers take note of. Those surveyed were shown different headline types that mapped to various content types and were asked which they would be most likely to click on. Data and stats beat out the rest by a significant percentage, being the top type for 45% of B2C and 46% of B2B buyers. This is likely because data and stats present easily consumable information that can be compared across products/offerings in a very apples to apples way. Even though B2B businesses generally spend more time blogging than B2C, the study found that B2C buyers prefer blog posts at a far greater rate than B2B buyers. And while many think of video as a way to reach B2C more than marketing to B2B, the research shows a significantly higher percentage of B2B buyers are compelled to buy through video. Now that we know what types of content compel people to buy, our job as marketers should be to create these things that make people act. 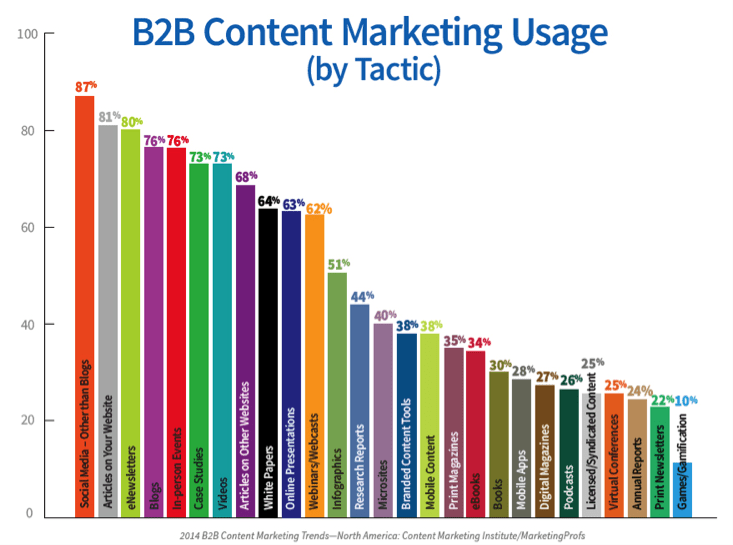 When comparing the type of content that compels people to buy (above) with the types of content that B2B content marketers are actually producing (below), it would seem that many are spending a lot of their time in the wrong places. Though much of the content created for social media, website articles, newsletters, and blogs may be higher up the funnel, we need to ensure we’re creating enough of the stuff that makes people really buy (read: data and stats) further down the funnel also. It may be easier to crank out piece after piece of high-level funnel content, as it’s light and generally takes less work to make, but if we aren’t producing an even greater quantity of lower-funnel pieces, there’s nothing to lead potential buyers along the journey to a conversion. Armed with the knowledge of what type of content causes people to buy, we can now ensure we show potential buyers content that have the greatest chance helping them make that buying decision. Consider your content mix and the purpose of each piece. Are you offering buyers the things they need to pull the trigger? Make the choice to buy an easy decision for them.